Tuesday is the one year anniversary of when Jon asked me to marry him on a deserted beach in Key West. I had an entire evening planned out for us. On Monday night a good friend was going to baby-sit. 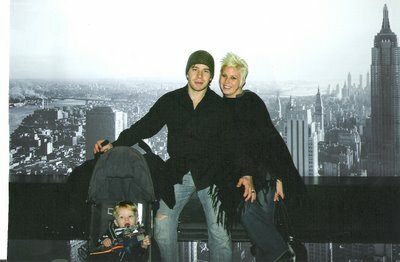 We were going to go down to the Top of the Rock (Rockefeller Center), enjoy the view, maybe go ice skating after. Then we would head downtown to Beppe, a very great Italian restaurant. Jon also happens to be buddies with the chef. This exciting plan got squashed when we decided to go back to Cleveland for Thanksgiving. So instead of be bummed, I rescheduled the plan for last night and to include the boy. We got all dressed up, hopped on the Q train and headed into the city. Catcher liked the train at some points. He was flirting with some Russian ladies and they were ignoring him so then he started pointing. So funny. We kept our plans for Top of the Rock but we nixed Beppe (being a Friday night and all). For dinner we headed to Little Korea, we had some interesting food that I in know way will attempt to name. As a family we had a great time and the timing of the entire evening was perfect, although our train home got held up because of a 'police matter,' but we made it home eventually.